BYD Auto - Chinese car manufacturer, located in Shenzhen (China). BYD Auto is a subsidiary company BYD Company Ltd, which was first announced itself in 1995. Auto company BYD model promotes the development of "self-development, private label, self-development," considering their purpose "Production of high-quality world-class vehicles," and the purpose of the industry "Creating a world-class national automotive brands," and promising to revive the national automotive industry. Currently, BYD company has four production bases in Shenzhen, Xi'an, Shanghai and Beijing. In 1995, the number of employees was only 30 people. Own car brand began to develop after the acquisition in 2003 Tsinchuanskoy automotive company in Shaanxi Province and the formation of "auto company BYD». From Tsinchuanskoy carmaker company inherited the model «Flyer», which is available until now (2007). The first own development was the F3 model, which was sold to 10 000 per month as of the first half of 2007. The auto company BYD created a car town, where the total production capacity of 300 000 vehicles. In the city of Xi'an has production line for the production of sedans was built. In the city of Shanghai was a center for scientific research and experimental development. The company is actively engaged in the development of electric vehicles and has already introduced a variation F3e model. December 11, 2012 BYD signed an agreement with the Bulgarian company Bulmineral on the organization of a joint venture for production of electric buses. January 9, 2013 it was reported that the automaker has received EU license to sell electric buses in all participating countries. In China, on the results of 2014 recorded a significant increase in sales of electric cars and hybrids, as well as the rapid development of this segment as a whole. Thus, in comparison with 2013 year, segment sales grew by 324%, reaching 74,763 units, and electric vehicles production increased by 4.5 times. In 2015 the projected growth in sales of electric vehicles can reach 150-200 thousand, doubling compared to 2014 year. Innovative sedan BYD Qin became the sales leader in the segment of electric cars and hybrids in the Chinese market. In 2014, the sales leader in the segment of electric cars and hybrids become innovative sedan from BYD Auto - BYD Qin. Show results in the 14,747 vehicles sold during the year, it surpassed twice the nearest competitor with a score of about 7000 cars sold. Ever since the start of sales in January 2014 Qin established records of sales in virtually every month, provoked a stir among buyers. For example, more than 6,000 units of this promising hybrid cars were sold in the first weeks of 2014. Which popularity is not accidental, because the Qin offers its owner a really amazing opportunities. Thanks to the Dual Mode II technology, the car has outstanding dynamic performance with acceleration to 100 km / h in just 5.9 seconds, a top speed of 185 km / h, with fuel consumption of just 2 liters per 100 km. The total capacity of the power plant is more than 300 hp, which is an amazing indicator for serial passenger cars. In pure electric mode, Qin can travel more than 50 km. The long journeys, as soon as the battery is used up, the aid comes economical gasoline turbocharged engine volume of 1.5 liters. 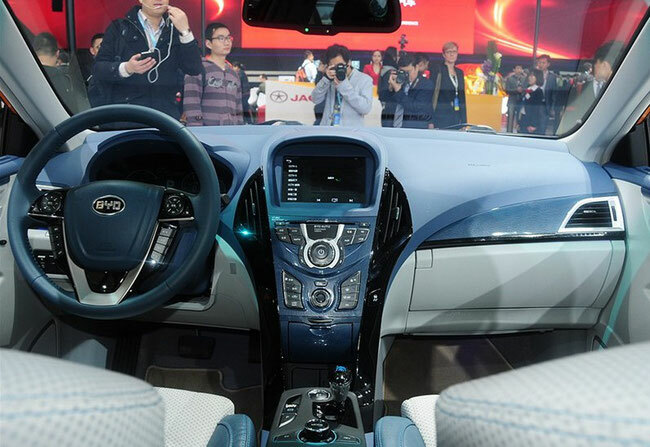 Senior vice president of BYD Auto Stella Lee commented on the success of the model: "The news that Qin led by sales rankings is not a surprise for us, because there is simply not on the market as fast, cost-effective, modern and accessible model of the hybrid car." 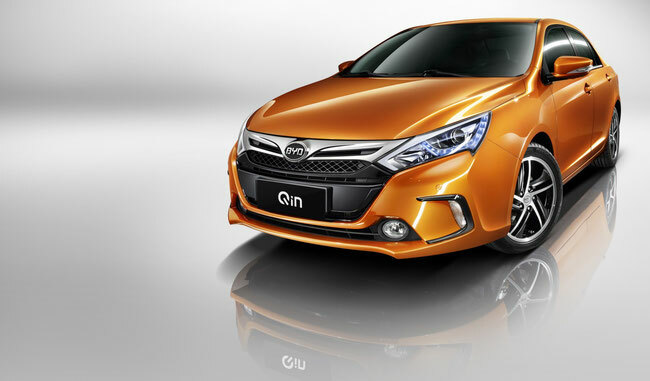 Qin - a first sign of the family of the new generation of hybrid cars from BYD. In the near future the market should also do a hybrid crossover Tang, featuring the same excellent performance dynamics and fuel consumption. Currently, BYD Qin presented on the markets of China and Latin America, but BYD Auto management is considering the possibility of expanding the presence of the card model. Information on deliveries to Ukraine it is not, however, the company "EuropeAid Automotive Corporation", the official importer of BYD vehicles in Ukraine, has long been engaged in the popularization of electric transport on the territory of our country. Recall that in an electric BYD e6 was established Ukrainian record for 2013 to range electric vehicle mileage on a single charge. Then e6 overcome 358 km of Crimean serpentines to charge 15% of the remainder. Interestingly, this result is even higher than the factory figures, indicating a high potential of electric vehicles is really integration into passenger transport, the trend to which the observed worldwide.